Packages are part of your Online Plans. There are two types of Online Plans you can create: General and Membership. The package setup is almost the same for both types - the only difference is that you do not need to set up package features and pricing table for packages you create under a Membership plan. Find the plan for which you want to create the package and click on its name. Next, scroll down to Packages and click New. Select the location(s) that the Package is available at by clicking a Location name and then using the single arrow button to move it to the right (use the double arrows to make all Locations available in a single move). Under Package Name, enter a name for your package, select the Product that you are creating it for and select the client type to which you would like to make it available. Under Pricing and Discounts, select your price for each billing schedule (leave blank billing schedules that are not required). Check the box if you want to setup discounted internal pricing. Configure your Setup Fees if you charge any - add a fee name, select the product you've created as a setup fee then add the price. Set up your Deposit - add a name, select the product you've created as a setup fee then add the price. Add-ons allow you to upsell additional services alongside the main product of the Package. You can add different (or the same) recurring services to each package. These will be added to the agreement created and billed as a recurring charge alongside the main product. You can add as many Add-on services as you like by clicking the Add Another Add-on button (bottom left of the screen). After creating your Add-ons, click on the Next button (top right of the screen) to continue building your Package. NOTE! - Things to watch out for with Add-Ons! If you are creating a Membership Plan and you intend to include the same Add-ons for all Packages in that Plan, take care to make sure the Add-on Name is identical in each Package. This will avoid the Add-on from being listed twice on the Purchase page. E.g. If you have 2 packages both with 'Locker' it will only be shown once on the Purchase page. If you have 2 packages, one with 'Locker' as the Add-on name, and the other with 'Lockers', both will be listed on the Purchase page, even if they are both associated with the same product. If you want your package to include a meeting plan, then you can select it here. Simply check the box to enable the option, then choose the plan using the dropdown. This willl be listed on your portal when customers purchase your Online Plan. Read more about creating meeting plans! Add a Notice Period - Check the box for ‘Is there a notice period’ and enter the number of months’ notice that you require from a customer to terminate their agreement with you. Skip to Step 8 if your package is for a Membership plan. Showcasing a Package makes it stand out from your other Packages, perhaps one that you have a current promotion running for or the one that represents the best value purchase. As well as making the individual Package stand out as a Featured Product, you can also apply this to a period on the Pricing Schedule, if you are using more than one pricing period. 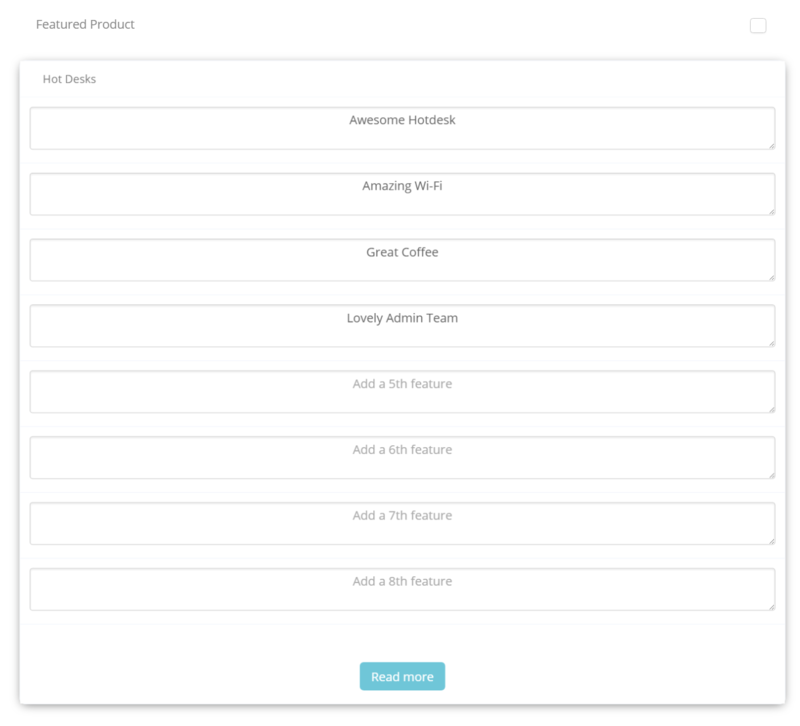 Tick the Featured Product check box to apply the hot strap and make one Pricing Schedule period stand out from the others. You can also add up to 8 features to showcase what is included in the Package for that pricing schedule. Once a customer has selected their Package, they will then see the choice of Pricing periods to select from. The next thing you need to create is the email template that will go to the purchaser of the plan. This should confirm what they have purchased, welcome your new customer. It should contain a link to your Portal and the purchaser’s login details. It’s also a good idea to explain to your new customer what they can expect to find and what they can do in your Portal. Use Merge Fields in all boxes, except for the Subject line. This will ensure that the system pulls up the correct information automatically, for each customer who purchases your plan Click on the Merge Field picklist to see all the available fields. Select the field that you want to use, then copy and paste the merge field value into From, To, CC, BCC, as well as the email message body, within the text editor. There are all the usual editing tools for you to customize the template to look and feel how you would like it to. You can add images or even click on Source to cut and paste some HTML directly into the template. As with the email template there are editing tools to customize the Terms and Conditions that are displayed on your Portal, in association to the Package you are setting up. Terms and Conditions should be applied to all Packages that you create. Just as when a customer signs your T&Cs on a regular agreement, the same applies when purchasing online. Copy the relevant T&Cs into the T&Cs area in the Package. When a customer goes through the Check Out process they will need to tick the Terms & Conditions box to show that they have agreed to them; otherwise, they will not be able to finalize their purchase. Making a customer tick that they accept your Terms & Conditions ensures that the customer agrees to conditions applicable in order to use your products and services. Clicking on the Terms and Conditions link will open a new browser tab and display the Terms and Conditions text that you have entered. Scroll down from the Terms and Conditions template to find the ID Requirements area. As with the email and T&Cs template, there are editing tools to customize the ID Requirements. It is not mandatory to complete an ID Requirements sections. It will depend upon the requirements your organization has for purchasers of the particular product. However, informing your customers regarding ID Requirements is essential when your organization requires the completion of Money Laundering Forms, or proof of identity etc. How it works: Filling in this section provides a validation box on the purchasing page. The purchaser must confirm that they have read and agreed to the ID Requirements by checking the ID Requirements box before they can proceed with their purchase. Clicking on the ID Requirements link will open a new browser tab and display the ID Requirements text that you have entered. Now click Save to save your Package.